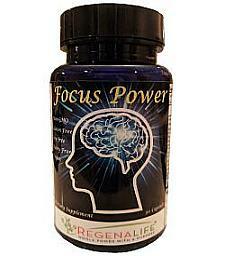 Focus Power supports memory function. We utilize a superior, more powerful & more bioavailable form of B-12, Methylcobalamin and others use Cyanocobalamin which is a synthetic form of B-12 and has less bioavailability. Other great ingredients are the Bacopa Monnieri Extract and Vitamin B-3 combined with Alpha GPC for maximum absorption. Some research suggests that a vitamin B12 deficiency is linked to dementia and memory problems, therefore a daily intake of B-12 supports the whole body. Free of wheat, processed sugars, syrup, gluten, corn, salt, hydrogenated oils, soy, barley, dairy, egg, yeast, caffeine, synthetic sweeteners, artificial color, fragrance, preservatives, monosodium glutamate (MSG), and genetically modified organisms (GMO's).